The Dow Jones Industrial Average has fallen over 280 points today (Oct. 5), increasing a rout that began during Thursday's (Oct. 4) trading session. With losses continuing to mount, investors are wondering what is causing the Dow Jones Industrial Average to fall on Friday. In order to keep our readers informed, we've identified two key factors that are pushing all major indexes in the red. Today's sell-off is largely the result of this morning's disappointing jobs report and rising bond yields. First, the U.S. Labor Department released the September jobs report this morning. According to the report, the nation's total nonfarm payroll employment increased 134,000 – well below the 185,000 economists expected. A drop in national hiring rates is often interpreted as a sign that economic growth is slowing. When growth slows, public companies are less likely to generate the kind of profits they need to sustain soaring share prices. 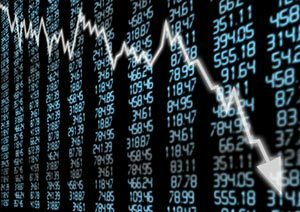 As a result, investors sell off their shares and the stock loses value. And that's exactly what we see happening today. Investors who own stocks listed in the Dow Jones Industrial Average are closing their positions in case it turns out the stocks can't produce better returns. Second, the Dow is also falling today thanks to higher interest rates imposed by the U.S. Federal Reserve. Wall Street reacts negatively to higher interest rates because they increase borrowing costs for companies that need to borrow in order to finance their growth. As a result, higher interest rates can restrict economic growth. And that's bad for investor returns in much the same way slowing jobs growth is. Right now, it's too early to tell if today's poor performance is the beginning of a huge market downturn.